BRODY Professional Development is a global training and coaching organization that enables individuals and organizations to boost performance. Their methodology uses a system that not only influences and inspires but also empowers those with whom they work to unleash their potential through support and long-term development. The client was experiencing a transition of leadership. They wanted to recreate their corporate website by starting from scratch. 3 Media Web began the process by helping the leadership to discuss their different viewpoints and to use their previous successes to re-tool for the future. We facilitated this discussion and benefited from this effort to create a competitive website. The result was a unified vision that honored the past while creating a new brand. 3 Media Web completely rebuilt the BRODYpro website with a simplified navigation and all-new content in 80-plus pages. Our discussions helped the client to clarify their differentiation from their competition and how best to explain it. We used dramatic and attention-getting testimonials, sprinkled throughout the site. The images and text are large but uncrowded. The two key sections of the website – Services and Flexible Delivery – clearly explain what they do and the options for receiving these services. 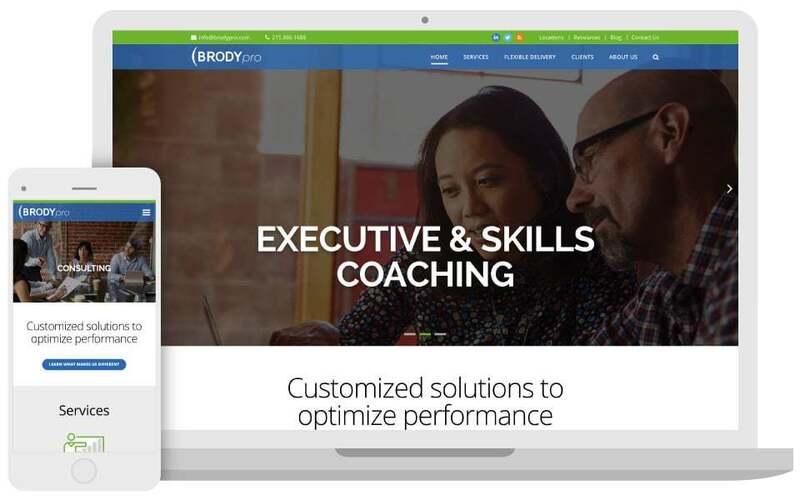 The new BRODYpro website met the client’s goal to launch a new brand that communicates vital information necessary for potential clients to choose BRODY Professional Development for all their training and coaching needs.